President Medvedev is irritated as ever that the Defense Ministry and OPK aren’t moving out smartly to rearm and reequip the Armed Forces. He’s trying to kick them into gear, but can he get results where his predecessors either didn’t care or simply failed? According to Kremlin.ru, Medvedev met this afternoon in Gorki with a host of government officials and industrial chiefs. They included, inter alia, Sergey Ivanov, Anatoliy Serdyukov, Vladimir Popovkin, Nikolay Makarov, Denis Manturov, Yuriy Borisov, Sergey Chemezov, Sergey Nikulin, Mikhail Pogosyan, and Roman Trotsenko. Medvedev’s opening monologue enumerated what’s been done for defense industry — providing a full state defense order and financial support, creating integrated development and production structures [OSK, OAK], etc..
Medvedev goes on to say that all relevant documents, including the GPV 2011-2020, have been signed, but the assembled group still needs to think about how to implement the GPV. He reviews how he talked at the Defense Ministry Collegium in March about balancing producer and buyer interests, about justifiable and understandable prices. But in many areas, says Medvedev, this has already become moot, and he intends to increase responsibility for the fulfillment of these obligations. First, he wants a Federal Goal Program for OPK Development in 2011-2020. Its focus is to be “real readiness” of the OPK to produce actual weapons and equipment. Second, he wants the Defense Ministry to finish placing GOZ-2011 completely by the end of May, and advance payments issued to producers in accordance with the 2011 and 2012-2013 plans. It’s unacceptable, he says, that high-level decisions have been made, money allocated, but a product isn’t supplied. He recalls his late 2009 Poslaniye in which he said 30 land- and sea-based ballistic missiles, 5 Iskander missile systems, nearly 300 armored vehicles, 30 helicopters, 28 combat aircraft, 3 nuclear submarines, one corvette, and 11 satellites would be delivered in 2010. Medvedev finishes by saying he knows military production is profitable, and it’s possible to attract strategic investors. He says he wants to talk about how to stimulate investment. The goal for the day is concrete reports on what’s been done on the level of those responsible for organizing work and correcting the situation in defense industry. Not exactly throwing down the gauntlet, just another warning that he’s getting serious. But it’s doubtful the government or defense industry will take Medvedev seriously until he fires a minister, other high-ranking official, or an important enterprise director. And it’ll probably take more than a couple dismissals to get anyone’s attention. Medvedev is running out of time on this account (as well as others). Those he’d like to make responsible or punish will just take the tongue-lashings and wait him out. Friday Marker.ru reported rumors from its sources saying First Deputy Defense Minister, and GPV 2011-2020 architect, Vladimir Popovkin will relieve Anatoliy Perminov as Director of Roskosmos. This is interesting because it supposedly features a little tandem tension between President Medvedev and Prime Minister Putin. Marker.ru’s Ivan Cheberko writes that Perminov will resign at “his own request,” and become a presidential adviser for space issues. 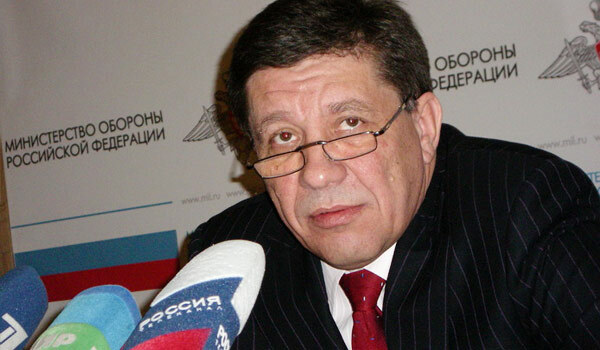 For his part, Popovkin had hoped to replace Sergey Ivanov as Deputy Prime Minister with responsibility for the defense-industrial sector. But Medvedev and Putin couldn’t agree on Ivanov’s fate, according to Cheberko’s report, and they proposed that Popovkin should head Roskosmos. Cheberko’s two independent missile-space sector sources say there have been three candidates for the Roskosmos job — Popovkin, Popovkin ally and deputy General-Lieutenant Oleg Frolov, and Roskosmos Deputy Director Vitaliy Davydov. Frolov reportedly would have gotten the job if Popovkin took Ivanov’s spot. Roskosmos rank-and-file lobbied for Davydov in hopes of avoiding changes Popovkin would make. His views diverge from those of the agency’s current leadership, and he’s expected to make many personnel and organizational changes. Among other things, Cheberko highlights Popovkin’s strong support for a new liquid-fueled heavy ICBM versus missile designer Yuriy Solomonov’s vocal public opposition to such a plan. Unfortunately, Mr. Cheberko only dug so deep. There’s a bit more to this story. On the eve of the 18 March expanded collegium, Sergey Ivanov told the Federation Council the Defense Ministry was to blame for late placement of the State Defense Order (Гособоронзаказ, ГОЗ, or GOZ) this year. Even prior, he had lots of sharp public criticism for Perminov, Roskosmos, and their failures. Of course, Ivanov himself has long suffered at Putin’s hands over GLONASS, so he’s just letting stuff roll downhill, so to speak. In his collegium speech, President Medvedev railed about problems with the GOZ last year, and demanded a “post-flight debriefing” to identify which industry and state officials are to blame. 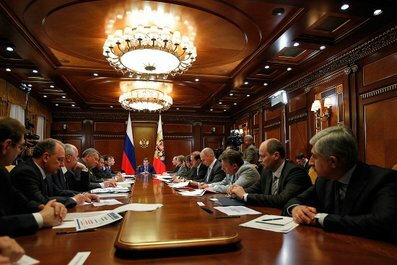 Prime Minister Putin followed the collegium with a March 21 government session on the defense order at the Votkinsk missile plant. 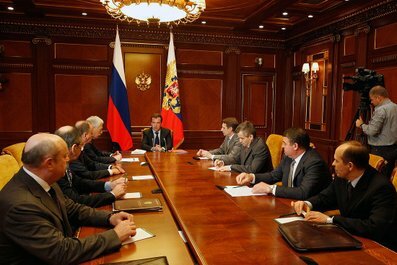 Ivanov and Perminov were there, and probably Popovkin too. The latter was very much on the defensive afterwards, asserting that GOZ-2010 was fulfilled “on the whole.” And he blamed last summer’s heat wave and forest fires for disrupting defense production. So where’s it leave us? As Marker.ru implies, it appears Popovkin’s position isn’t too strong, and he could be headed out of the Defense Ministry after only 8 months on the job. This would take away one of the louder proponents of buying arms and equipment abroad if necessary. It begs the question who replaces Popovkin, and what does it mean. Possibly someone closer to Serdyukov. Never known for his skill as a political infighter, Sergey Ivanov actually comes out of this looking like a semi-adept bureaucratic warrior. It’s interesting to imagine Medvedev and Putin discussing Ivanov’s fate when he was once thought the frontrunner in Operation Successor 2008. Would the Army Oppose Siloviki Loyal to Putin? An unnamed FSB veteran thinks it would. Monday New Times published a piece on the state of the tandem and political prospects over the next year leading up to the elections which will determine who will be Russia’s president until 2018. The authors asked former USSR intelligence and special service veterans of coup d’etats to sketch out what we’d see in the event of Apocalypse Tomorrow. They sketch out some of the things Putin and the government would do in addition to calling for the support of the siloviki. In the end, the article examines the possibility that Putin might agree to go, with the right personal and financial guarantees in place. His situation is not, after all, exactly like Mubarak’s or Qaddafi’s. Interesting scenarios, but there are a couple things your present author isn’t so sure about. Firstly, two things not factored in that could be significant are: the mood of the average militiaman [i.e. cop] who are very numerous and are also being ‘reformed,’ and the unhappiness among military retirees and older vets demonstrated recently in their Moscow assembly and last year on Poklonnaya gora. One’s not sure, though, if they’re more supportive of Medvedev or Putin. Given the choice, they’d probably shoot both. Secondly, is Medvedev really the type to enter that kind of standoff (or any standoff actually) while holding very few, if any, good cards to play? At the same time, one is cautious about assuming rational actors. It’s perfectly conceivable the Russians could blunder and miscalculate their way into Apocalypse Tomorrow. Meanwhile, Ancentr.ru was following a similar tack earlier this week . . . it looked at the recent personnel decisions regarding General-Lieutenant Valeriy Yevnevich which moved him from the GUBP to Deputy Chief of the General Staff and then to Assistant to the Defense Minister (ostensibly, to advise on peacekeeping activities). The website thinks this interesting since Yevnevich is a ‘political’ general who as Taman division commander supported President Yeltsin in the 1993 battle with his opponents. And, it says, such a decisive and staunch supporter of ‘democracy’ as Yevnevich could be useful to vlasti in a responsible post given the general growth in political tension in society, including also a “rise in disloyalty in the army.” For example, he could command special VDV or other sub-units in an emergency to ensure their loyalty to the regime. Ancentr.ru goes on to detail other reports from NVO’s Vladimir Mukhin about the level of discontent in the army’s ranks as well as ex-General Staff Chief and Security Council staff member Yuriy Baluyevskiy’s possible role as leader of a military backlash against Defense Minister Serdyukov’s reforms. One can’t avoid Wikileaks forever . . . you’ve already read about “alpha dog” Putin, and Medvedev who plays Robin to Putin’s Batman. But not many media outlets picked up on Defense Minister Serdyukov’s story, but Argumenty nedeli did. This is really no more than anecdotal confirmation of what’s been known all along — Serdyukov was put in place by Putin, and he’s part of Team Putin. While appropriately deferential and respectful of President Medvedev, Serdyukov is very unlikely to get in a situation where he might have to cross his mentors from Team Putin. 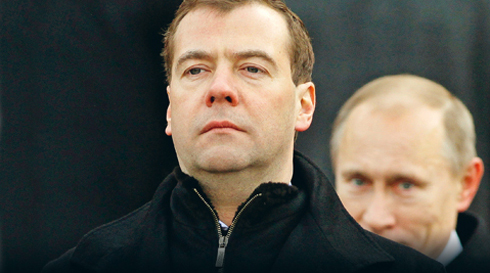 Medvedev himself is part of the Team writ large, but he’s from a different, and less influential branch. So, the ruling tandem has a senior and junior member and everyone knows it. Not exactly a revelation, but Serdyukov’s admission makes for a funny story, and no small embarrassment for him now in dealing with Dmitriy Anatolyevich. Last Tuesday, the Lyubertsy Garrison Military Court held President Medvedev’s dismissal of Lieutenant Colonel Viktor Biront to be illegal. 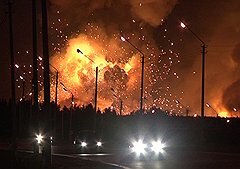 Recall Biront was the President’s and the Defense Ministry’s scapegoat when the 2512th Central Aviation-Technical Base of Naval Aviation burned in this summer’s infernos near Moscow. 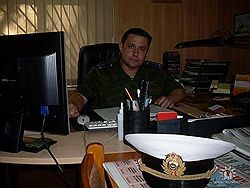 A criminal case for negligence was also raised against Biront, but, according to Moskovskiy komsomolets, they punished him by dismissing him “in connection with nonfulfillment of contract.” Biront fought back, and an inquiry revealed that, as of 1 February, the base’s firefighting unit had been disbanded, a 50-meter fire break hadn’t been established, and firefighting supplies were absent. Biront had informed his leadership, but was ignored. Biront’s lawyer also argued that his client had an impeccable 26-year service record, and had only been in charge of the Kolomna base for 3 months and 25 days. The lawyer said Biront was left with 70 sailors to dig a fire safety zone around an 8-kilometer perimeter. And Biront’s predecessor was fined for trying to dig this zone on his own. The lawyer says the Defense Ministry plans to appeal the overturning of Biront’s dismissal. In Kommersant’s version, Biront and 30 sailors fought the fires armed with nothing but axes. One officer told the paper a chain reaction following Biront’s victory was likely, as others dismissed make similar appeals based on the lack of due process. So, one can conclude that Medvedev’s ‘tough guy’ on-the-spot firing in the 4 August special Sovbez session was really nothing more than feelgood PR at best, or stupid at worst. But, if they want to get Biront, they will, especially for being impudent enough to fight the system, and not being a quiet, cooperative victim. Biront is one of those allegedly superfluous officers denigrated by the victors in Serdyukov’s ‘new profile’ reforms for being a ‘housekeeper,’ uninterested or unprepared to conduct combat training. The news about the Biront case has received very little media attention.